Deputy Jimmy Deenihan: Nos. 14 to 17 Moore Street are the subject of a preservation order under the National Monuments Acts. The effect of the preservation order is that any works affecting these properties require the consent of the Minister for Arts, Heritage and the Gaeltacht, under section 14 of the National Monuments Act 1930, as amended. The landowner’s application to my Department for consent to proposals that include the provision of a commemorative centre to the 1916 Rising and its leaders on the national monument site is being examined. As part of the consent process, the applicant was asked by my Department to provide an environmental impact statement in regard to the proposals for the national monument site. The public consultation period in regard to the environmental impact statement was extended because of the requirement for the applicant to publish a fresh public notice when the original notice was found to be deficient. The extended period ended yesterday. Following completion of the consultation procedures, I now intend to proceed as quickly as possible to undertake a formal environmental impact assessment, including consideration of the submissions received, and then to make a decision on the consent application itself. My function in regard to the upkeep or maintenance of the monument, which is privately owned, is confined to considering any related proposals by the owners for which my consent must be sought under the National Monuments Acts. The monument buildings are included in the record of protected structures, maintained by Dublin City Council under the Planning Acts, which gives the city council specific powers of intervention that are not available to me. However, from time to time, my consent has been sought and given under the National Monuments Acts for necessary maintenance and repairs. This includes, most recently, essential stabilisation work on the building facades. Deputy Maureen O'Sullivan: Nos. 14 to 17 are the national monument and they are only still standing by the skin of their teeth. The Minister knows that what the Save Moore Street group, the relatives and I would like is to see that area as an historic quarter. If we look at the Venice Charter and apply that to Nos. 14 to 17, Moore Street, we can see that the monument there is more than a stand-alone entity. It has to be and is linked to the surrounding environment, and part of that environment is the historic laneways and terrace of Moore Street, which is also linked with the street trading tradition that is synonymous with Dublin and with the businesses there. It is interesting that there is a new and expanding restaurant business on Moore Street, the Paris Bakery, which is doing extremely well. It is also linked to what could be the potential for housing while maintaining the facade of the terrace. The remit of an organisation like Habitat for Humanity is to go in and take over derelict buildings, so there is huge potential for the whole area to be preserved as a historic quarter in a way that is fitting and acknowledges the heroism and contribution of the men and women of 1916. There is an onus on the Minister to take Nos. 14-17 into State care under the auspices of the National Museum. There are calls for an independent assessment of the site. This has been going on for a while. An archaeological report has been produced by the National Museum which we are still waiting to see. The developer wants to develop the site. Nos 14-17 are included in that but the developer is in NAMA. Has the Minister had any discussions or is he planning to hold any discussions with the Minister for Finance? How can we find out about the NAMA accounts? I have been trying to discover what they are applied for. If they are in NAMA, how will they do this work? There are many dots that must be joined up but they seem to be getting further and further apart as time goes by. Deputy Jimmy Deenihan: I am sure the Deputy is very much aware that it is Dublin City Council that has responsibility for the structure and stabilisation of the buildings. All I am asked for is my consent. In this case, the developer asked me for my consent in respect of seeing whether the works are suitable for that site. The Deputy should direct her request to Dublin City Council with regard to the fabric and structure of the buildings. It is very important to point that out. I repeat that I have been asked to adjudicate on whether the proposal for Nos. 14 to 17 is suitable for the national monuments site. All of the consultation has taken place and I will be making an assessment of the statement submitted by the landowner and observations by Dublin City Council and others. I will be making that assessment and I assure the Deputy that I want to reach that determination as soon as possible. I hope that this will be before we end this Dáil term in July. Deputy Maureen O'Sullivan: I acknowledge the role of Dublin City Council with regard to this and still cannot believe how it managed to sell that area to a developer. I have said so more than once. Can the Minister refuse consent to buildings in the vicinity of the national monument? Can the developer build over, under and around it in a way that is totally inappropriate to the monument? The environmental impact statement is not available online. I am conscious of Fr. Joe Mallin who I understand is the only surviving direct relative of someone who fought in the Easter Rising. He is in his nineties and is a priest in Hong Kong so how could he and others outside the country possibly have an input into the environmental impact statement if it is not online? Deputy Jimmy Deenihan: This was made available at Dublin City Council and my Department so it was available to people and I am sure it could have been delivered to Fr. Mallin by post or express mail. The fact is that the consultations are now over, it is time to make a decision and I am prepared to do that as soon as possible. The point is that, at the moment, Nos. 14 to 17 are in a dilapidated state and that state is worsening all the time. The developer is failing in its duty to maintain the monument. Deputy Richard Bruton: I am pleased to say that a preliminary first reading agreement was achieved on 9 April last by the Irish Presidency of the Council on the draft EU accounting directive, which we had set as a priority during the Irish Presidency and which is an important item of EU legislation. The EU Committee of Permanent Representatives approved this preliminary agreement at its meeting on 17 April, thus preparing the way for adoption of the accounting directive on the basis of the present text. The directive is important in that it updates the EU's accounting legislation and provides for simplification and administrative burden reductions, in particular for small and medium enterprises. It is one of the final outstanding parts of the Single European Market. Also, under specific provisions of this directive, at chapter 9, information on the revenue streams which governments in resource-rich countries around the world receive from European companies active in the extractive industries and in the logging of primary forests, will require to be provided by the industries in question. As a consequence, the populations of these countries will have this information available to them. This acts as an accountability mechanism vis-à-vis the governments in question. In the accounting directive, natural resource companies - large companies and public entities - will be required to report all payments in excess of €100,000 to governments and local authorities in the countries where they operate. This information will facilitate accountability of both companies and governments to citizens of mineral rich countries regarding the contracts that they undertake. It will increase transparency of the moneys that oil, gas, mining and forestry companies pay to governments and local authorities. Under the reforms, companies will need to publish total payments for each country in which they operate and for each project, taxes on profits or production, royalties, dividends, bonuses, related fees and payments for infrastructure improvements. There is no exemption for disclosing these details in countries where this may breach local laws. The provisions of the accounting directive will take effect in the European Union two years, at the latest, after its adoption. Deputy Maureen O'Sullivan: My question was submitted just before that directive was signed. I acknowledge the work the Government and officials have done to support the accounting directive. This is something NGOs and civil society have been seeking for some time. The EU Commissioner, Michel Barnier, has said that local communities in resource-rich countries will finally be better informed about what their governments are being paid by multinationals etc. for exploiting oil and gas fields, mineral deposits and forests. This directive must mean more than that they will be better informed, because these communities are losing out big time. They should see the benefits of the resources in their countries. Some $1 trillion disappears without trace from developing country, abetted in the main by multinational companies evading taxes. The disappearance of these moneys is also supported by corruption on the part of officials. This issue has been called the ugliest chapter in global economic affairs since slavery. Deputy Maureen O'Sullivan: Will Ireland build on what has been achieved in the directive, particularly in chapter 9, to create and support greater transparency in country-by-country reporting? Deputy Richard Bruton: Absolutely. I thank the Deputy for her commendation of the officials in my Department, who have done a great deal of work. As she probably knows, painstaking work is required to get these things over the line. I will convey her remarks to my officials. It is clear that abuses have developed in this area. The NGOs have been extremely exercised about it, and rightly so. The directive creates a charter for transparency. I understand that similar provisions are included in the Dodd-Frank legislation in the US. We are beginning to see a commitment on a broad global basis to having more transparency in this area. I hope that reduces the sorts of abuse mentioned by the Deputy. Deputy Maureen O'Sullivan: An effort needs to be made at UN level to highlight the issue of tax justice and to tackle the illicit movement of taxes from particular countries. Did the Government support the inclusion in the review clause of additional sectors, such as telecommunications and construction, that could be included in the directive? While I accept what is being done with regard to oil, gas and mineral reserves, I think similar efforts could be made in other areas. It is interesting that at a recent climate change conference, President Higgins outlined some figures to demonstrate the extent to which multinational companies dominate particular sectors, such as the food sector, in the developing world. There is great scope for action to be taken in this huge area. There is great scope for Ireland, as a well-respected country, to do more to build on what has been done with regard to tax justice. Deputy Richard Bruton: I will have to get back to the Deputy on the wider sectors she mentioned. I understand there has been broad-based support from the Council, the Parliament and the NGOs for what has been achieved here. One always has to get all of one's supporters together in order to get an item such as this through. I know my Department was keen to deliver this and I congratulate those involved in getting it across the line. I will get back to the Deputy on her supplementary question. Acting Chairman (Deputy Seán Kenny): Amendments Nos 33 and 34 are related and may be discussed together by agreement. The categories mentioned for the disbursement of funds are sport and recreation, national culture and heritage, including the Irish language, the arts, health of the community, youth welfare and amenities and "such other objectives as the Government may determine from time to time". That is a little vague. Both Deputy McDonald and I propose the inclusion of the natural environment given its importance. The Irish Environmental Network and the Irish Wildlife Trust do important work and they have a wide range of programmes and activities. The thrust of what they do relates to the maintenance of healthy water and soils and clear air. If we cannot do that, the current economic recession will be nothing compared to what we will face in a recession affecting the natural environment unless we look after it. I am conscious of this because I have spent most of the past two days at a conference in Dublin Castle on hunger, nutrition and climate change where I listened to the voices of communities all over the world and the challenges facing the environment and the way of life of fishermen, farmers, pastoralists and so on. I acknowledge we are not quite in that position but we must be proactive and take our responsibility seriously. There could be an opportunity in this section to include the natural environment. I do not understand how that would open a floodgate to anything else. The organisations to which I refer do a great deal of work and a significant element of the work is voluntary. If they were to pay for the more than 6 million hours in voluntary work at the national minimum wage, it would amount to €55 million. I am passionate about our natural environment and we should protect it as best we can and give as much support and resources to these organisations as possible. They are precluded the way the section is worded. If the words "natural environment" were inserted, these organisations would have an opportunity to access funding. This is the least resourced sector and I hope the Minister can consider this. The environment is good for our physical, mental and emotional health and that is why I tabled the amendment. Deputy Brendan Howlin: The large number of existing categories of good causes provided for in section 41 include "national culture and heritage" and "youth, welfare and amenities". The advice I have received indicates that these categories cover many of the issues Deputies have raised. It is clear from the significant direct contact I have had with Deputies on this matter that the natural environment lobby is healthy. I also received a submission on the issue from my colleague, the Minister for the Environment, Community and Local Government. On reflection and notwithstanding my replies to parliamentary questions, I am concerned to ensure the categories of good causes are not broadened to such an extent as to dilute their impact. Moreover, I do not want to dislodge proper funding from the Department of the Environment, Community and Local Government or other sources through moneys disbursed by the national lottery. Notwithstanding these concerns, Deputies on all sides have made a compelling case for broadening the scope of the definition. For this reason, I am willing to accept amendment No. 33. I am agreeing to accept Deputy Maureen O'Sullivan's amendment rather than Deputy McDonald's amendment for the reason articulated by Deputy McNamara. The revised section 31 provided for by acceptance of the amendment would create a more natural sequence of categories as it would not slot in the new category after the catch-all provision provided for currently. The new wording provides for an important addition to the text, one which could usefully address many of the environmental projects people undertake. Natural walkways, including Slí Charman in my constituency, come to mind but there are a great number of good environmental projects which could be usefully funded from the national lottery. I hope the lottery will be expanded and have a larger purse to distribute to good causes. 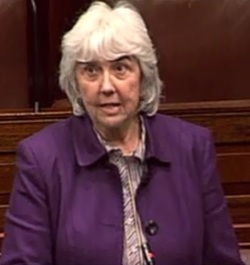 Deputy Maureen O'Sullivan: Having spent approximately five hours getting nowhere with amendments to the Animal Health and Welfare Bill, the Minister's decision to accept the amendment is welcome. I thank him and the Deputies who spoke in favour of the amendment, from which only good can come. Tá sé tábhachtach aitheantas a thabhairt don Teachta Ó Caoláin de réir an obair a dhein sé chun tacú leis na mná agus chun an ábhar seo a chur chun cinn. Lean sé ar aghaidh nuair a bhuail sé le fadhbanna agus le deacrachtaí. Tá sé uafásach scéalta na mban seo agus sonraí an ghnáthaimh seo a léamh. Deputy Ó Caoláin has been relentless in pursuing justice for the women. In spite of the many difficulties and frustrations he has experienced over the years, he never gave up. Having read the women's stories, I find it horrifying to imagine the procedure. I cannot imagine what it must have been like to have gone through it. The one word to describe the procedure is barbaric. It is very difficult to reconcile that barbarism with what we associate with the medical profession. Doctors swear the hippocratic oath, which is basically about practising medicine ethically and honestly. While there are variations of the oath, I read today a comment that warmth, sympathy and understanding may outweigh the surgeon's knife or the chemist's drug. Warmth, sympathy and understanding were very sadly lacking for the women involved. I join others in acknowledging the women present in the Gallery who suffered that cruelty. I acknowledge their pain - for many of them their acute continuing pain. They have got on with their lives throughout all that pain through perseverance and the great support they give each other. Deputy Ó Caoláin mentioned mutilation, which is also an apt word for a procedure that unhinged the pelvis, severed joints and sundered pubic bones. Some women ended up permanently disabled, incontinent and in pain. Very sadly, some women lost their babies following the procedure. It was an operation that was undertaken with no explanation given to the women as to what was happening - never mind why it was happening. The last time we discussed the matter the Minister made certain statements about this being a standard operation, mostly used as emergency surgery and safer than a caesarean section. He did not accept then that this was a barbaric act. 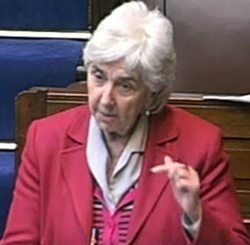 However, all of that was refuted by Ms Marie O'Connor, who made very detailed comments about each of those points. I listened to the Minister's speech from my office after I had to leave the Chamber. I acknowledge that he made a commitment to deal with the issue sensitively and fairly, which is why he is accepting the Bill. It is a major achievement to have this agreement. It is a tribute to the women that this support has been agreed. 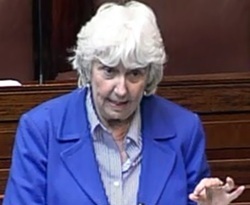 The Minister said Deputy Ó Caoláin's Bill contains some flaws. Regardless of the flaws, the Bill must achieve its objectives, which starts with lifting the current Statute of Limitations. However, there is an urgency about this - I say this with no disrespect to the women - given that the women are of advancing ages and cannot continue in the limbo they have been in for so long. Health services must be provided to meet their health needs. I read a comment from a medical person who stated he felt this was a stain on Irish medicine. This is an opportunity to get rid of that stain from Irish medicine. Overall, Irish medicine does not deserve that stain. It beggars belief that it ever went down the road of symphysiotomy. The Dáil adjourned at 8.55 p.m. until 10.30 a.m. on Wednesday, 17 April 2013.